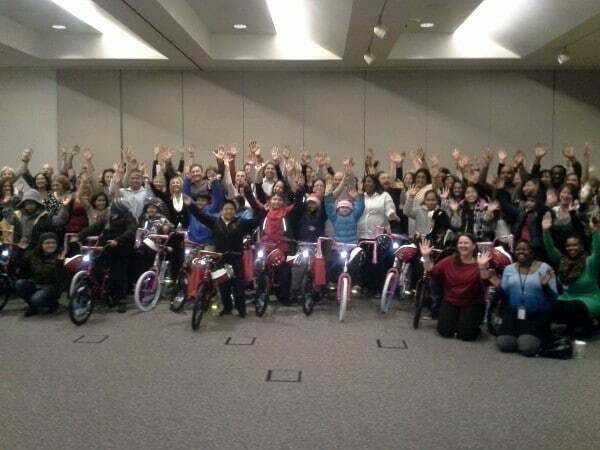 Johnson and Johnson had experienced many successful team building events with the Leaders Institute and decided to keep up the tradition by having them perform another Build-A-Bike ® team event. This particular event was held at the Global Headquarters in New Brunswick New Jersey in mid December in order to leave their employees with a valuable team building experience before the Holidays. There were 100 eager enthusiastic employees from the Human Resource division ready to participate in the team strengthening exercises. Participants were amazed with the beginning exercises that emphasized that by doing things differently they would get more successful results. The crowd was then split into groups and tasked to use their ingenuity to come up with team identities and team cheers that incidentally were very creative. All the teams showed a great competitive spirit and tremendous energy to try to win a head start in the actual bike building competition. When the actual bike building began the teams assembled in their groups and pooled from the individual’s particular strengths to quickly solve their clues to obtain the bike parts to complete the whole bikes. After all groups had finished building thier bikes, the local Salvation Army Boys and Girls club ushered in 16 excited children to be presented with the bikes. The event was a huge success for everybody!